Trustee Eliza Zisk addresses the AAS 2015 Annual Meeting. 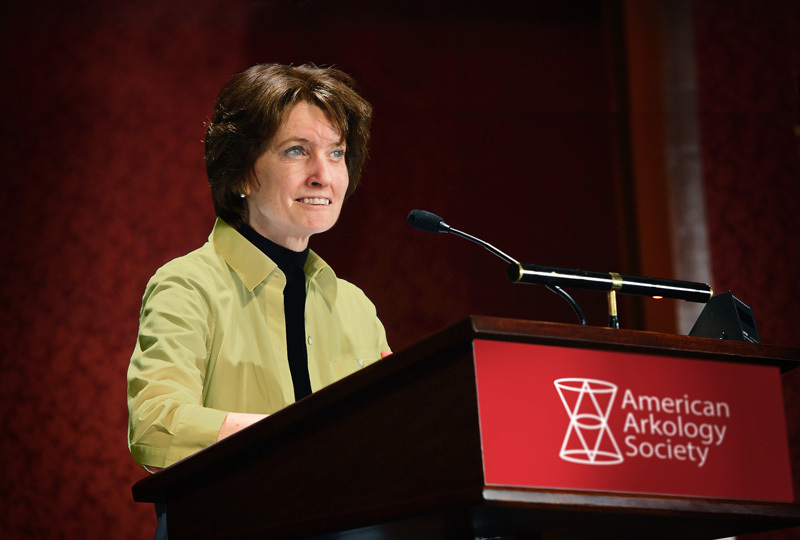 The American Arkology Society’s Council is comprised of its Governing Board, Past Presidents, Chairpersons of the Managing Committees, and representatives from all affiliated Local Societies. The Council meets annually at the Society’s yearly meeting. The AAS’s Governing Board oversees and manages its financial affairs, including its annual budget, investments and endowments, fund-raising initiatives, and divestitures where applicable. The Governing Board is comprised of five officers as well as 15 Trustees elected by the AAS’s Council. The Board meets four times a year. The AAS’s Executive Union provides governance and guidance for AAS affairs in between meetings of the Governing Board. The Union consists of 11 members: the President, First Vice President, Vice President for Academic Outreach, Vice President for Future Studies, Vice President for Technology, Treasurer, and Executive Director and four Trustees. The President of the Union appoints the Trustees on an annual basis. The Union meets via conference call between meetings of the Governing Board.